The department offers a wide range of diagnostics and treatment of chronic or acute orthopedic and traumatologic disorders. The surgical team of doctors has been educated and trained in Germany in Berlin, and they have actively been there in surgery for many years. One focus, in the minimally invasive treatment (keyhole surgery), is acute and chronic discomfort in the joint of the knee and shoulder. The surgical procedures are usually performed arthroscopically. 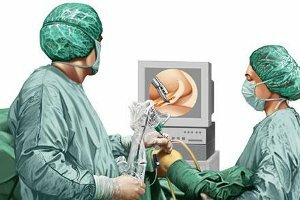 This means that the operation takes place with two or three small stitches using a camera with a monitor and special instruments without the necessity to open the joint with a large incision. This procedure offers the patient a gentle, low-risk surgery with faster recovery. Another focus of the department is the treatment of acute and emergency care in trauma. This includes the classical treatment of wounds but also diagnostics and surgical therapy for injuries of the bone (osteosynthesis, internal fixation). The injuries of tendons and nerves concerning hand surgery can be treated professionally as well. Integrated into the department are also both vascular and plastic surgeons. Diseases in the field of pediatric surgery are treated as well. For urgent and planned operations modern diagnostic and treatment systems are provided. In addition to ultrasound and conventional X-ray machines also computed tomography (CT) and magnetic resonance imaging (MRI) can be used for accurate imaging and diagnosis. The operating rooms are equipped with modern instruments aimed in particular at the minimally invasive surgery (arthroscopy tower, microscope).